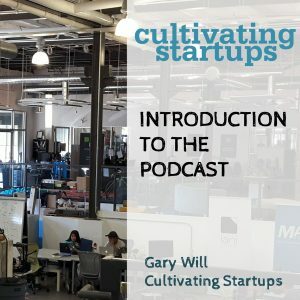 In this introductory episode of Cultivating Startups, it’s just me, Gary Will, talking about what the podcast is about and what I hope you’ll get from it, and then finishing off with a bit of background on me. Short version is that, while there are plenty of sites and podcasts (and books and YouTube channels, and so on) about startups themselves, there’s much less on startup ecosystems and startup communities … even though regions around the world are now devoting significant resources in an attempt to build them. As these initiatives grow in number, more and more people are working within startup ecosystems—and there’s a whole world of expertise, perspectives and experiences to connect to. That’s what I hope to do with the podcast. And the goal is to go beyond nuts-and-bolts “checklist” issues and look at startup ecosystems in a deeper context, including such issues as why we’re doing this, who should be doing it, and how do we assess whether it’s been successful. Thanks Alex! I appreciate your feedback. Good to have you listening. It all sounds like a reasonable plan in my head, so we’ll see how it plays out in the real world!